NEWS FLASH! 2019 REUNION HOTEL SELECTION AND RESERVATION INFORMATION NOW AVAILABLE! THE HOTEL for our 2019 REUNION IS READY TO RECEIVE YOUR RESERVATIONS, SO YOU CAN MAKE THEM NOW, IF YOU WISH. PAY ATTENTION TO THE DETAILS ON THE FLYER. You are encouraged to make your reservations early, so you don't miss the deadline date on the attached flyer. We have plenty of rooms in our block, and don't have to worry about a competing "city-wide" convention being sprung on us as we did for the 2018 Reunion. Attached is a flyer with all the information you need to make your 90th Division Association 101st Annual Reunion Reservation. We are very excited to be at this hotel, which is in the French Quarter and newly renovated. It is a beautiful Hotel with that special New Orleans French Atmosphere. The planning for our stay at this Hotel is moving forward, and there will be details in the SPRING, 2019 Newsletter, along with a Reunion Registration Form. IMPORTANT! 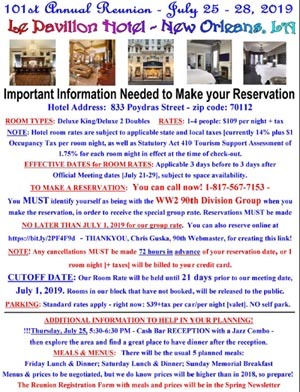 READ THE INFORMATION CAREFULLY, AS ALL THE DETAILS YOU NEED TO MAKE A SUCCESSFUL RESERVATION ARE ON THIS FLYER. Let's make this another Memorable and Successful 90th Division Association Reunion! !